I figured out how to incorporate the discipline and intuitive eating techniques I was brought up with as a kosher girl with a nutritionally balanced whole foods plan that curbed cravings and kept me full and satisfied while living my busy life. I use the same principles in my nutrition practice, BWN, with my clients of various backgrounds and ethnicities. I can see how successful these principles are on the BWN method not only with their weight, but with their overall well-being: improved energy levels, boosts in mood and quality of life. 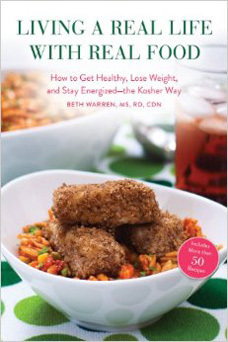 Get your copy of Beth's new nutrition and recipe book Secret's of a Kosher Girl! Get your copy of Beth’s new nutrition and recipe book, Living a Real Life with Real Food.